Our holidays take place in selected beautiful places and are lovingly and very thoughtfully organised. In a sensitive atmosphere, you connect with your innermost life energy. In these meditation holiday you can invite joy of life and creative impulses combined with lightness and consciousness into your life. In this guided journey to a powerful, spiritual place you have the opportunity to get to know India in a way that will touch your innermost depths. The journey has the potential for a fundamental inner transformation. You can find a new quality of life by deepening your meditation. In our tour group it is possible to travel safely. You can completely dedicate yourself to your inner experiences and spiritual exploration. Let yourself be carried away in the flow of life, without any interference or pressure. In this natural letting go, you can experience a new dimension of lightness and joy. In honest encounters with yourself and others, you open yourself up to love, sensuality and inner silence. I am infinitely grateful to you for your knowledge of India’s culture and mindset and for how you guided the seminar: benevolent, respectful, calm and welcoming. A unique place for meditation, relaxation, meeting, celebration, creativity … The OSHO International Meditation Resort. 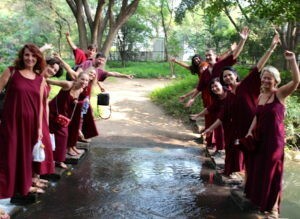 Spend an intense and relaxing meditation holiday at the OSHO International Meditation Resort in Pune. In this oasis for meditation, still and active OSHO-Meditations support you to go deeper and you can easily recharge your batteries with warmth, effortlessness, spontaneity, happiness, serenity and tranquility. Choose from moment to moment what calls you to the journey into your inner world: Tai Chi and Yoga classes, dance meditation in Buddha Grove, courses and individual sessions such as Rebalancing massage, Evening Meeting with OSHO discourse, changing nightlife program like open-air disco or you relax in the sauna, in the jacuzzi and at the swimming pool. It is a unique place for meditation that will support you in your inner transformation. The taxi will take you directly from the airport in Mumbai or Pune to the accommodation. In the evening we meet for the Italian dinner in Dario’s restaurant. 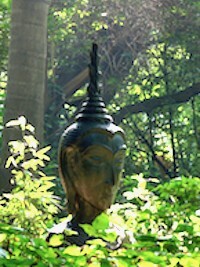 In the morning we meet in the Welcome Center of the OSHO International Meditation Resort. On a Welcome Morning, you’ll get a comprehensive introduction to details that you should know about the Resort for an inspiring time. In the following days, you can choose between a variety of offers to deepen your meditation and connect with your Being. I’ll guide you figure out how to make the most of your stay. Having lived in the resort for several years, I am available to support and guide you with my experience in your spiritual growth as well as in many small practical things to ensure a smooth process. There is the opportunity to participate in courses, sessions or meditations at the resort and relax at the pool, meet friends or let yourself float through the day. Shopping in select stores in Koregaonpark and Mahatma Gandhi Road. Enjoy a typical Indian restaurant in the evening. We will be accommodated in near by selected Guesthouses or in the OSHO Guesthouse, which you can book directly through the Resort. If you want, we can go on an afternoon shopping trip. 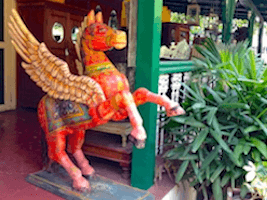 In Koregaonpark and Mahatma Gandhi Road are some great shops where you can find clothes, fabrics, saaris, bronze statues, incense sticks, jewelery, decoration and lots of interesting Indian stuff. In an Indian restaurant we will have dinner in the evening and dive into the typical Indian way of life. In the evening you take the shared taxi for a 3.5 hour drive to the airport in Mumbai, from where you fly back home, filled with many new impressions, warmed by the Indian sun and recharged with new life energy and you will land back home on Sunday, 1 December 2019. The intelligence of the heart creates poetry in your life, gives dance to your steps, makes your life a joy, a celebration, a festivity, a laughter. It gives you a sense of humour. It makes you capable of love, of sharing. That is true life. The life that is lived from the head is a mechanical life. You become a robot – maybe very efficient; robots are very efficient, machines are more efficient than man. You can earn much through the head, but you will not live much. You may have a better standard of living but you won’t have any life. Life is of the heart. Life can only grow through the heart. It is the soil of the heart where love grows, life grows, God grows. Extra costs: flights, visas and meals. Additional charge per week: standard single room € 80, special double room € 40, special single room € 120. Please ask for prices to extend when booking.